The “On The Road” Scroll’s 50th Birthday in L.A. 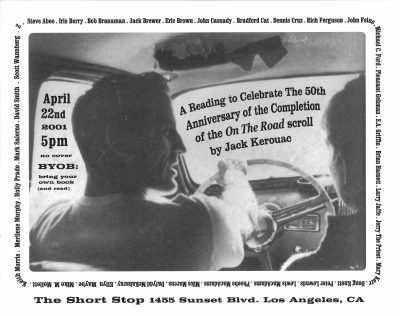 This bit is about 2001’s 50th anniversary of Kerouac writing his On The Road scroll — and a show we put on for the occasion in L.A. on the day he finished it, April 22nd, after one held in NYC on the day he started it (also covered in the book). I arrived at the Short Stop speakeasy well before showtime and it was already a chaotic circus of crazy creatives carving up the scenery, led by the director of today’s movie, S.A. Griffin. Amazingly, he’d had a shirt made emblazoned with the classic OTR line about “… the mad ones … DESIROUS of Everything AT THE SAME TIME …” written in creative font-smashing text covering his chest — broadcasting its meaningful message in a playful style, perfectly reflecting his prankster essence. The club was already a buzzing hive full of L.A. actors and poets and show people decorating the large performance space with bodies and actions — a room that looked like a fancy Goodfellas’ lounge from the ’50s or ’60s with almost no lighting so the celebrities and gangsters and cops could discreetly entertain in deep red booths surrounding the open dance floor in the middle — the only lighting being flickering candles in large red-tinted translucent holders on every table as well as lining the perimeter of the stage. In the middle of the dance floor lay a giant 3-foot-by-4-foot photo of the first part of The Scroll — and scattered all around it like fallen leafs were page leafs of On The Road that throughout the celebration people would pick up any random one and read it from the stage, a la Burroughs’ cut-up method, except whole pages to collage the poetry of the prose into a swirl of images and passages and dialog and details jumbled together proving how powerful and consistent the wordsmithing was that you could hear chapter 1 or 51 and it would still fit together like a matching set. S.A. created something I’ve never experienced at any Jack show before or since — a massive mad celebratory krewe of joyous orgasmicly LOUD participatory audience–stage–melding dancing dingledodies — AND I mean, LOUD! It was MAD high energy at 6PM on a Sunday like it was a midnight on Saturday night at Mardi Gras. The room became more than packed. The pages on the dance floor were soon blown up to the lip of the stage as it filled with men & women floor-dancing in floor-sitting crosslegged positions, and the doorways crammed with faces peering in. And like the rock star he was, Cassady came strolling in just before showtime with his latest babe on his arm and perpetual smile on his face. He was laughing and she was beaming and the party was screaming and I felt like I was dreaming. From the moment S.A. stepped to the microphone to open it — and he’s one guy who doesn’t even need a microphone to fill a room with his booming performer’s voice — the souls he’d assembled soared and roared like an arena rock show. 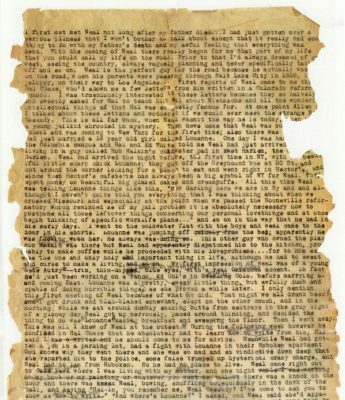 I kicked it off with the beginning of the original Scroll text that I’d gotten from maestro master Dave Moore transcribed from the two photographs of it that had been published by 2001, and right from the first line people were Howling “Go!” and “Yeah!” and “Wow!” and laughing and cheering. And the next readers began improvising off-script and working the room, the audience riffling in lines in harmony with Jack’s in a collective kaleidoscopic recreation of the creation of the Beats. As loud and orgasmic as new life comes! with beaming faces and embracing hugs and love and sweat and knowing twinkles between bubbling souls. There were no rehearsals, no memorized scripts, just the chaos of people running to the microphone with parts of the Scroll or part of the Book in what S.A. coined “Bop Bingo!” And people were yelling “Go Go Go!” from the swirling booths, and S.A. copping “the mad ones” line in this mad hang-out as it blazed from his chest in case anyone missed the obvious. Then one of his crazy Carma Bums co-conspirators, Scott Wannberg, stepped up to speed-read Jack at the tempo he probably typed, causing even faster “Go”s from all over the room. Then John and I took the stage, the Bebop Brothers flip the page, bringing back the driving sage, pinning needles on the gauge. And how he loved his Dad, and even if other people claimed Neal was off having Adventures with them, it felt to John like his Dad was home all the time. And how his Mom had to be the disciplinarian, and how he grew up with a fairly idyllic childhood — one parent providing the roof over head and meals on the table, and the other being a big playmate. And every time Jack would quote his Dad yelling, “Whoo!” or “Go!” to the jazz, the audience would yell it back to John creating a call-and-response song out of a prose-and-participate book. And sitting right in the front was a gorgeous cross-legged L.A. woman dancing from the waist up, arms flowing in hypnotic figure-eights, fingers snapping … then exploding like slow-motion fireworks, all in an above-waist interpretive dance — part sign language, part snake-charming seduction. And Sugar Magnolia, as I took to calling Aurora, was half the time on the side of the stage, half the time against a wall in the light in our joyous view, and half the time at one of the tables taking notes. And John & I hit The Road together — reading the Jack & Neal car-riding “IT” section from On The Road that George Walker & I would later appropriate and open every one of our 20 shows together 20 years later, but this was the first time either John or I ever duetted it, and he had the Neal rhythms down. Naturally. And speaking of tunes, the most musical of all the Cassadys, Johnny C. Goode, broke out his electric guitar and filled in the colors as I read the part of On The Road after his Dad dropped off Uncle Jack in the California sister city of San Francisco and he started to have hunger-induced hallucinations. “I had reached the point of ecstasy that I always wanted to reach, which was the complete step across chronological time into timeless shadows, and wonderment in the bleakness of the mortal realm …” as Johnny accented the “wonderment” with his crystalline lines. And with the Ken Burns’ Jazz series having just aired on PBS, we thought we’d offer up Jack’s own history of jazz in one of the OTR riffs that Kerouac’s principal musical collaborator David Amram remembered as one of Jack’s favorites that he liked to read aloud — the “children of the American bop night” paragraph that begins, “Once there was Louis Armstrong blowing his beautiful top in the muds of New Orleans …” where he lays out the whole evolutionary tale in one page that Ken Burns took 20 hours to tell. And Johnny picked up on the Johnny B. Goode echoes when Jack wrote of “Charlie Parker, a kid in his mother’s woodshed in Kansas City, blowing his taped-up alto among the logs, practicing on rainy days” and how that was captured so similarly by Maestro Chuck — “Way back up in the woods by the evergreens, There stood a log cabin made of earth and wood . . . He used to carry his guitar in a gunny sack, Go sit beneath the tree by the railroad track,” as John melted Bird and Berry into a single rockin Bebop-a-Lula, and oh boy that little country boy could play! Ragtime became Swing became Big Band became Bop became Rock n Roll became the Acid Tests became Woodstock became a million bands that burned burned burned like fabulous roman candles across the land. The audience was now howling like a collective mad Moriarty yelling for us to “GO! !” as Cassady soared and the audience roared with every new chord that felt like a sword pulled from a stone! Excalibur! “There he is! That’s him! Oh God, Oh God, Cassady, Yes! Yes! Yes!” And Johnny was conscious of the madmen in front of him, he could hear every one of their gasps and imprecations! Here’s an excerpt from another book — The Hitchhiker’s Guide to Jack Kerouac. Or here’s an excerpt from How The Beats Begat The Pranksters. Here’s where you can get the Beats – Pranksters book. Or here’s another live Jack show tale — the Northport Report — about Big Sur’s 40th. back up in the woods to Chuck’n rock in a gunny sack. Oh yeah the boy can write! Loved the last two books. Looking forward to reading this one. It sounds fun. Thanks again. I should buy this book. Love your work. So glad you are on another book. It looks good and so true to your style. I read the last one soon after the publication — you really lined up the ducks with that one. I am living by the clock and you are using it. The fires are being stoked.